One label with a real knack for finding top shelf doom and black metal is that of Hypnotic Dirge. Introduced to them last year with the excellent Epitimia, looking through their catalog has brought some intriguing finds. So when any new release is announced, it gets some attention. This time, the band in question is that of Canadian doomsters Norilsk, for whom The Idea of North is their first full length album. 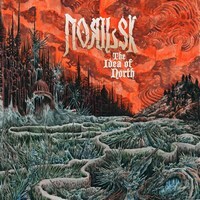 The most interesting aspect of Norilsk is how the band appears to have two faces, yet somehow the album ties itself together as a collective whole. The first half of the album comes off as a bit heavier overall. The opening number, “Japetus,” contains some lumbering sludge that comes off as a bit energized almost. “Throa” also boasts some really thick, bordering on aggressive sludge-y flavor to it, and “La liberte aux ailes brise” contains some of the most enjoyable melodies of the disc. Along with it, a change of tone for the remainder of the album. The second half of the album eases off of the heaviness and brings out a bit more atmosphere. Some tracks feel more like a funeral march, such as “Potsdam Glo,” whereas others, such as the title track, usher forth cold, bleak melodies that echo the feeling of a long winter (much like the one we Northeasterners have been sitting through). The Idea of North keeps an identity that is mostly their own while keeping things quite diverse for a doom metal album. Some may be caught off guard by the approach, but the band embraces their own melancholy and it works. With many of the doom variety often playing to a certain audience, it’s nice to see a band think outside of the box, particularly when it’s their first true attempt at it.